This is my 100th post so I'm going to write about my fave destination, the Croatian Adriatic. It's definitely the hottest destination this and every summer for different reasons. This is our little house. I absolutely adore the palms and the pink oleanders. Here are some photos we took in Dublin. The weather on our trip was unbelievably good for April. Every single day it was sunny with occasional showers. That is, until we arrived in Dublin. Actually the first evening was fine, but the rain that started in the morning didn't stop for three days and it was cold and windy and grey all the time. The city itself is bigger than I imagined, or read about it. It is compact and easily walkable, but not when it's raining incessantly. What impressed me most was the striking Memorial to the Great Irish Famine, a poignant testament to one of the greatest tragedies in the history of Ireland. The Trinity College Library is also very impressive with its rare books and manuscript collections. It brought to mind my visit to St. Gallen, Switzerland, where there is an equally beautiful, although much smaller library, where we were made to put some huge slippers on our shoes. Yes, it's a beer, and a very good one, indeed. But it's also a charming medieval city, and although I spent only a couple of hours there, I think it's the nicest city in Ireland. It's small, it's walkable, with beautiful well-preserved buildings and a splendid castle overlooking the River Nore. The streets, called slips, are narrow, which, come to think of it, reminds me of little towns on the Adriatic coast and its islands. Butter Slip, one of the smallest in the city, is named after the butter stalls that lined this alley. 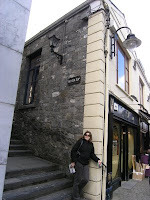 Kilkenny was named after a 6th century monk St Canice. Kil or kill means church in Irish. For those interested in learning Irish, Dia duit means hello.